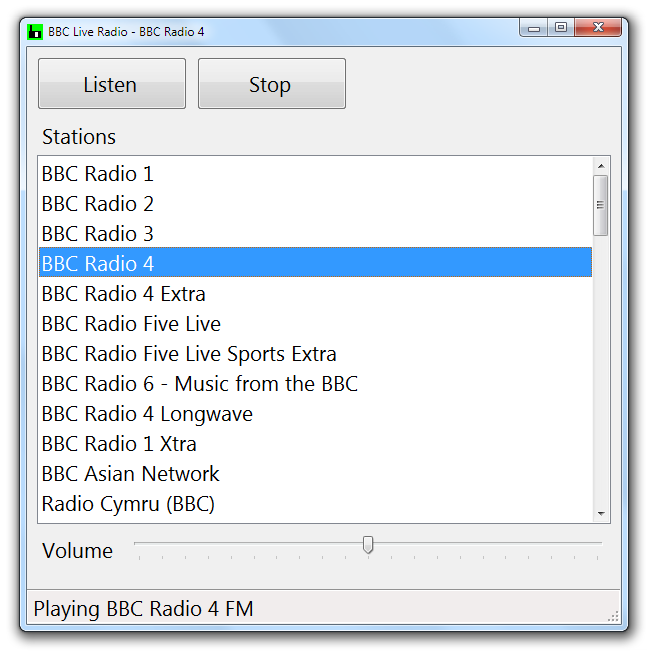 This simple application lets you listen to one of dozens of live BBC radio stations online with a couple of key presses. It's easy to use with any screenreader - much simpler than the BBC site. So you can enjoy listening to radio stations without lots of technical knowledge or difficulty. BBC Live Radio is free. You can get it from the link below. You have to run the setup.exe file that you get from the link, and everything will be installed for you. You will then have a desktop shortcut called "BBC Live Radio" you can use to start the program. You can also find "BBC Live Radio" in your Start menu. Installer for BBC Live Radio Run this MSI file to install BBC Live Radio. Stations featured include BBC Radio 1, 2, 3, 4, 4 Extra, 5 Live, 5 Live Sports Exra, 4 Longwave, 1 Xtra, Asian Network, the World Service, and dozens of regional and British stations like Radio Scotland and BBC Manchester. You also get Classic FM and National Public Radio from the United States! It's incredibly easy to use. You need only use up and down and the return key to select and play a station. Next time you start it it'll remember the station you chose, so you need only press return! Great for people who want everything as simple as possible. It works with every screenreader, from Thunder and NVDA through to JAWS and WindowEyes. It even works with the built-in Windows Narrator! Other little touches like the tab order (it always puts you on the radio station list, and there are only two buttons) and notification sounds (so you know it's starting to work, and when you're at the end or start of the station list) make it especially easy to use with no sight. You need to be on Windows XP Service Pack 3, Windows Vista Service Pack 2, or Windows 7 Service Pack 1, or Windows 8.1 Update. 32- or 64-bit versions are all supported. When the program starts up you will be given a list of radio stations. Press the up and down arrow or cursor keys to select a station. Then press the Return key to start it playing (there will be a delay while the station is fetched). To return to the list of programmes and stop playing press the Escape key or the Stop button. You can control the programme playing with the number key pad. Make sure that NumLock is on. You can then use 2 to lower the volume and 8 to raise it: 5 to play, 0 to stop and 1 to pause. The number keys on your main keyboard will also work. Fixed BBC World Service, Classic FM and National Public Radio (NPR) links. Removed HLS streams, now exclusively uses ShoutCast streams. This is because I noticed that on Windows 8 (which used the HLS streams) the stream would pause every ten seconds or so - clearly support for the M3U8 files isn't quite there. Updated to work with new BBC HLS and ShoutCast streams. Should work on Windows XP and later, as before.